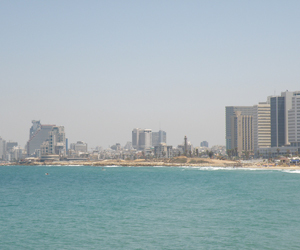 Located on the Mediterranean Sea, Tel Aviv is considered the second largest city in Israel. It is a bustling city that houses several foreign embassies, restaurants, hotels, and lovely attractions. With a vibrant population and round-the-clock life style, the city offers loads of tourist attractions and shopping areas, making it one of the best travel destinations to visit in the world. Divided into over 50 different neighborhoods, Tel Aviv, which is rich in history and culture, is a place to find magnificent and ancient port towns that are over 4000 years old. Founded in 1909 by a small group of Jewish citizens, Tel Aviv is today considered the heart of a booming, Israeli metropolitan area. Despite the fact that Jerusalem, the country’s capital, is home to most government departments, Tel Aviv is known to be Israel’s cultural and economic center with with a vibrant nightlife. With a population of over 3 million, Tel Aviv is the perfection travel destination in Israel that offers the best of fun and excitement. The city is also the most liberal city in the entire Middle East where homosexuality is considered legal. Tel Aviv’s Ben Gurion Airport serves as the main entry point for those international travelers who wish to visit Tel Aviv and Israel. The airport is one of the world’s most secure airports with massive duty-free shopping malls.Consider this when buying airline tickets to Tel Aviv, Israel. There are also loads of important festivals and events taking place on almost every weekend in Tel Aviv. Some of the notable events and festivals include Tel Aviv Fashion Market where the best top clothing designers in Tel Aviv exhibits their beautifully designed clothes; White Night Festival where locals and visitors celebrate Tel Aviv’s proclamation as a UNESCO World Cultural Heritage Site; and Night Flea where the lively flea market in Jaffa is usually bustling with activities throughout the night with several fascinating exhibitions and special events. Old Jaffa, renowned as one of the world’s oldest port with close proximity to the famous Flea Market, is a must see destination where Jonah boarded a ship before he was swallowed in the course of the journey by an enormous fish. The Beach is also a must visit especially during the summers that offer both local and visitors an amazing beach scene and fun filled moments. There are also loads of art galleries including the Eden Gallery, Bruno Gallery and Jojo Gallery that exhibits great works from renowned Israeli artists. Azriely Lookout which has a height of over 200 meters is a place where you can have a panoramic and magnificent view of the Tel Aviv area; and Dizengoff Centre which has a vibrant food market usually open every Thursdays and Fridays is one of the most iconic shopping centre in Isreal. Tel Aviv has a wide range of restaurants that offer both local and international delectable cuisine. Locals and visitors refer to Tel Aviv as “The city that never stops” due to its hedonistic lifestyle. Packed with a vast amount of bars, clubs and pubs making it the hippest city in Israel and the entire Middle East. The best time to visit Tel Aviv are during spring between the months of March and April, and Autumn starting from September to November. A trip to Tel Aviv will definitely be remarkable and worth your time. The cheapest international flights to Tel Aviv are on Mobissimo, the free travel search engine. In addition to cheap international flights to Tel Aviv, we help you find the best rates to both major and boutique hotels in Tel Aviv. Consider flexible travel dates when looking for the best fares to Tel Aviv, off-season travel or off-peak hours, or mid-week flights are all good options to lower your airline ticket fares. Consider also flying to other international airports in Israel : Elat, Haifa, Rosh Pina, Ovda. Mobissimo is also available on Facebook , Twitter, and other social networks, and our blog post fantastic flights deals to Tel Aviv daily.